The Melrose Georgetown Hotel is a AAA 4-star boutique hotel in Washington, DC offering remarkable accommodations and amenities. Sharing a Pennsylvania Avenue address with the White House, the hotel offers a prestigious setting just steps from Georgetown and the Foggy Bottom Metro station and convenient to top attractions such as the National Mall, George Washington University, the Kennedy Center, Smithsonian museums, and the Potomac Riverfront. Melrose Georgetown Hotel is home to the distinguished Jardenea Restaurant, which serves "Farm to Fork" cuisine throughout the day and has earned its culinary reputation under the direction of Executive Chef Nate Lindsay. The hotel is also home to a sophisticated bar venue, appropriately called the "The Lounge", featuring a unique bar chef concept allowing Melrose's professional mixologists to create signature beverages complimenting Jardenea's menu, using fresh fruit consomm� infusions to produce distinctly fresh flavors. At Melrose Georgetown Hotel, we embody the same characteristics of the Griffin, providing legendary service for each guest and strive to create a truly inspirational experience during every stay. 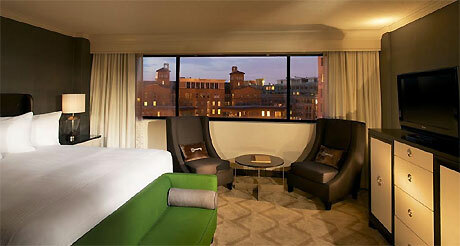 Guests of this Washington, DC hotel, enjoy large guestrooms and deluxe suites, luxury black granite counter top bathrooms, in-room safes, modern fitness center with weights and cardio equipment, 24 hour room service business center, valet parking, high-speed internet access, and more than 5,000 square feet of meeting and event space.